Francis is a legal assistant with insomnia and an inconsiderate party-happy roommate. She’s the kind of character I feel sorry for — having been in that kind of mind-numbing corporate environment longer than I’d like — at the same time I want to sit her down and give her some advice. She’s got no one in her life to turn to, no one who can put some perspective around her existence right now, so she stumbles through. Don’t get me wrong, she’s good at what she does and she’s not the lovable flake type all too common in indy works. She’s grounded and serious and so all the more someone I wish I could help. At work, she’s been assigned to clerk for the large company’s head of bankruptcies, a kind of promotion that results in more work and uncertainty for her. Her roommate, an actress, does nothing but get drunk and make Francis feel bad for worrying so much. Vickie drifts, and yet everything works out for her; she’s even talented. Francis struggles. Rilly clearly knows whereof he speaks, since he gets down the authentic details of this kind of corporate existence. His incidents are detailed and specific yet universally relatable. Visually, even though we’re watching a woman wander through office corridors, his work is outstanding. The clean lines and full environments are beautiful, providing a sense of motion that gives the feeling these characters are real and solid and about to move. There’s nothing unusual about seeing this kind of portrayal of uncertain new adults in comics, but Rilly draws it all so well that it felt fresh and worth reading. The portrayal of the all-powerful boss is particularly intriguing. He’s a bull of a man with excessively wide shoulders, a tiny head on top, and oddly blank staring eyes. In a weird way, he reminded me of Igoo from The Herculoids if he were human. 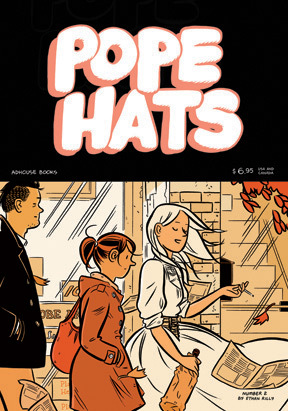 Pope Hats #2, in addition to this lengthy main story, contains a backup in which a young man traveling by bus monologues on his experiences during an overnight trip. There are also two one-pagers. Like an excellent art film, this comic is one I can come back to at different points and find new discoveries within. There’s a PDF preview at the publisher’s website; they provided a review copy.